NoteTab Light is the ultimate free Notepad replacement and a capable HTML editor. A slimmer version of the award-winning NoteTab Pro, this slick application makes text editing a breeze. Move quickly around a stack of large files with a simple tabbed interface. Format your text to your heart's content. 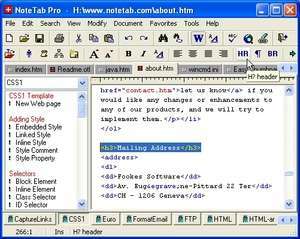 NoteTab Pro 7.2 is a shareware program and can be used as a demo to try the software until the free trial period has ended. A full version of the program is available after the trial period ends. For security reasons, you should also check out the NoteTab Pro download at LO4D.com which includes virus and malware tests. Additional screenshots of this application download may be available, too.